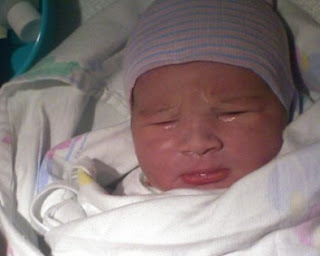 Passages to the Past: introducing my new nephew...Ayden Michael !! Weighing in at a whopping 9 lbs 6 oz and 21.5 inches long, is the newest member of our family, Ayden Michael (he is the spitting image of his father). Aaaaaaaah, he's so beautiful! Congrats to all! LOL he looks MAD! Just like my firstborn, as she was pissed off we dug her out after 26 hours of labor! Marie - that's the first thing I said when I saw this pics...man he's pissed! My mom was there and said he can really pout that lower lip! Ha! Congratulations, Auntie! He is adorable! 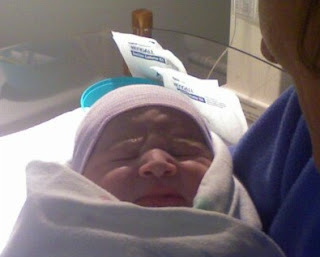 Congrats Aunty Amy, he does look a tad cranky! My second one looked like that just not as big, kind of like a scrawny, cranky rat LOL. He is just too cute, I swear! 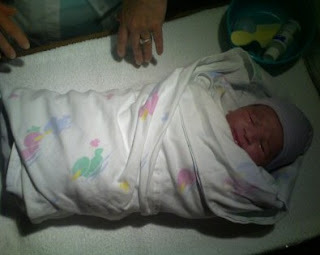 Congratulations to him and you on being an aunt to such an adorable baby! He's adorable. Thanks for sharing!